This was the very first attempt we had with making a deco instrument. 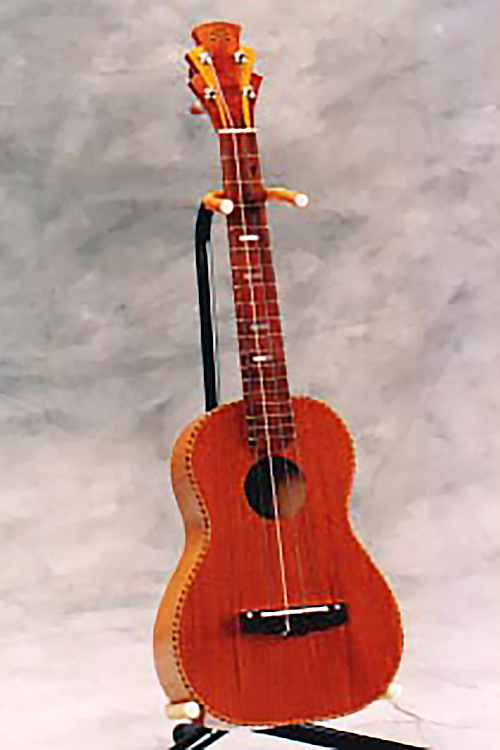 It hails from way back, circa 1996 and was built in Hawaii for a juried Hawaiian Woodshow where it placed with top honors in the musical instrument division, and that year beat entries even by the Kamaka Ukulele people! Currently this instrument resides in Japan in a private collection. Unfortunately we don't have better photos. It's built from lesser know Hawaiian woods, Cuban Mahogany, Ahakea, Breadfruit and Milo.